Chronic bad breath can be caused by an underlying medical cause such as throat, nose or lung infections and sinusitis, bronchitis, gastro-intestinal conditions or diabetes. If you are aware that your breath is not as fresh as you would like it to be, make an appointment with the Dentist for some advice and assistance. Bad breath [halitosis] is a common reason why many people visit a dentist. Everyone suffers from bad breath to some degree at some time – for example, when waking in the morning, especially when we have eaten strong foods or drunk alcohol the night before. In the great majority of cases, the causes of bad breath originate in the mouth; in a minority of cases the problem may originate elsewhere in the body such as the stomach or nasal passages. It is important to know whether this is a cause of concern. This is where a dentist can help. Gum disease is the most common cause of bad breath. It has two forms, gingivitis [inflammation of the gums] and periodontitis [infection of the gums]. 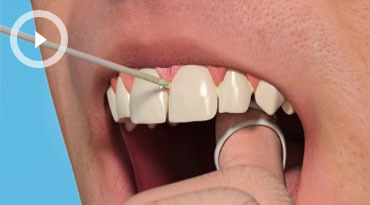 Periodontitis is the more severe condition. It affects the structures that hold the tooth in its socket and so can result in tooth loss. It often occurs with little or no pain and we are only aware of it when it is at a late stage. Bad breath can help us to detect this disease early. Tongue cleaning removes the surface coating on the tongue. It helps to reduce the amount of sulphur-producing bacteria and dead cells which tend to stick to the tongue. This will also remove any fluids that have dripped from the nose back on to the tongue (post-nasal drip). A tongue can be cleaned daily either by using a specially made tongue scraper obtained from a dentist.